There's really nothing that beats the dessert table at holiday functions. Cakes, pies, brownies, treats, cookies... mmm, the cookies. So when my girlfriends and I decided to get our crew together for a holiday shindig, there were no questions asked. Time to do a cookie exchange! In the chaos and fun of hosting all of our guests, I was totally a bad blogger and forgot to break out the camera. This time around, iPhone pictures will just have to do, I suppose! David and I hosted the party at our house, so I decided to get things started by making a few different cookies. I made chocolate + peppermint dipped sugar cookies, chocolate chip oatmeal cookies, gingerbread cookies and homemade oatmeal cream pie cookies. Oh yes, homemade oatmeal cream pies. They were Amazeballs, USA. I'll share the recipe on the blog later this week! My girlfriends also made some awesome cookies, like Andes mint chocolate cookies and chocolate iced sugar cookies. Don't worry, I tried them all. Scrumptious. Speaking of those lovely ladies, here we are in front of my rustic glam Christmas mantel. Aren't they all beautiful? I love my friends! Psst! I announced the winner of the Lulu & Georgia mirror giveaway right here! Was it you? 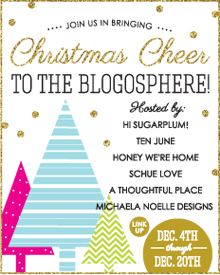 Also, don't forget that tomorrow is another big Christmas Cheer in the Blogosphere holiday link up over at Courtney's blog! She'll be hosting a holiday vignette party, so you can pretty much link up any of your holiday decor posts! Table settings... outside decor... that kind of thing. If it's holiday decor related, it's good for tomorrow's party! Yum I love a good cookie exchange! I spy really big thumbprints, so yummy! Oh my gosh. I think I just gained 10 lbs. just from reading this post. Any way you can post some recipes ...looks good!